This dish will make you weep with joy it’s so tasty! Packed full of strong, punchy Thai flavours you will be amazed by how such simple ingredients can produce this flavoursome dish. I served mine with lemongrass basmati rice or ditch the rice for a low carb option. – Start by making the marinade for the steak by adding all of the marinade mixture into a bowl and stirring well. Pour over the steaks and leave in the fridge to marinade for about 30/40 minutes. Or, if you’re really hungry, leave it to marinade whilst you’re making the rest of the dish! – Next make the dressing for the salad by mixing it altogether in a bowl and then set to one side. Prepare the salad and pour half of the dressing over it and mix well. Leave the other half of the dressing in the bowl to use later. – Heat up your pan with a bit of oil in the bottom so that the steaks don’t stick. When the pan is well heated add the steaks and cook for 3/4 minutes on each side. This will give you a medium rare steak so if you like your steak well done cook it for longer. It also depends on how thick your steak is. 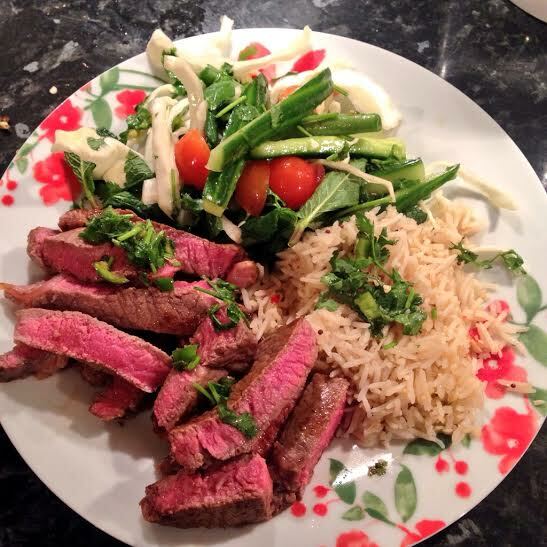 – Once the steaks are cooked leave them to rest for a couple of minutes whilst you plate the salad up (and rice if you’re having it). 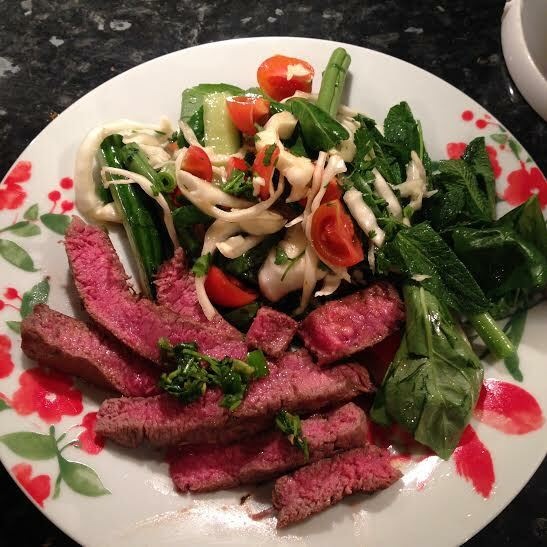 Chop the steaks in to thin slices and arrange artistically next to the salad on the plate – I tried! – Drizzle the remaining salad dressing over the entire dish and voilà – get ready to weep! After ours we had a chocolatey treat which is actually full of goodness – I’ll post the recipe for that on Tuesday so make sure to come back and get it out!